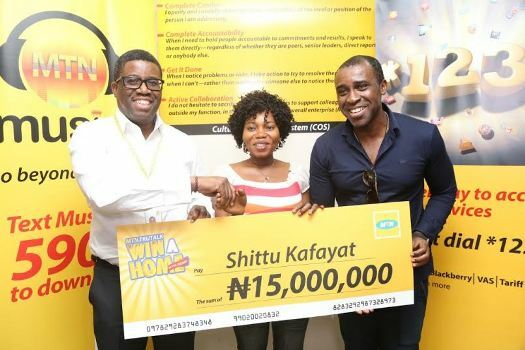 Big congratulations to Mrs. Kafaya Shittu, a lucky MTN retailer who won a house worth a whopping 15 million naira in the MTN best 11 promo. The smile on her face is golden as she shares her excitement with her family, neighbours and friends. When the MTN crew arrived at her shop in Iju Lagos and told her the good news, she was so ecstatic and cried tears of joy. Kafaya is a mother of two lovely kids and N15 Million Naira will surely go a long way in taking her and her lovely family to the next level. She qualified for the promo by registering her special 11 family members and friends on her Tru Talk package and talked these people regularly. When asked how she feels about being a lucky winner, she was full of praises for MTN and was very thankful for this wonderful prize. She also thanked MTN for keeping true to its word of rewarding loyal subscribers with awesome prizes. Y’all are required to check your mails and revert immediately. Also a special shout out to ‘Fleks‘ who’s our winner for the second time in a row. The hustle is real indeed! This exercise continues next week and we appreciate everyone participating. We want you to know that we do not take it for granted and it is our earnest hope that everyone wins something ‘tleast. Till then, keep it locked with yours truly.